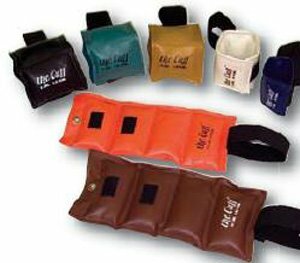 FEI deluxe Cuff weight set (32 pieces) The Cuff weight has been proven effective in hospitals for over 30 years. It contours to snugly fit the ankle, wrist... and even thigh. Its long velcro closure strap assures a secure and comfortable fit even during the most strenuous exercise program. It features heavy-duty materials and double-stitching throughout. They are color-coded, marked with both pounds and kilograms and grommeted for hanging on any weight rack. Product photo may not exactly match the product offered for sale. Please refer to the product description. If you have any questions about this product by The Cuff, contact us by completing and submitting the form below. If you are looking for a specif part number, please include it with your message. All Pro Adjustable Therapeutic Ankle & Wrist Weights - Ankle: 20 lb. = 20, 1-lb. wts. Sammons Preston - All Pro Adjustable Therapeutic Ankle, Weights 20 lb. = 20, 1-lb. wts.